* Department of Chemistry, Sri Krishnadevaraya University. Itukalapalli, Anantapuramu, AP. India, 515003. ** Faculty of Science and Technology, ICFAI University of Higher Education. Donthanapally, Sankarpally Road, Hyderabad, Telangan, India, 501504. A series of 15 sulphonyl urea derivatives (7a-7o) containing various heterocyclic substituents were synthesized, characterized by elemental analysis, IR, 1H NMR and 13C NMR spectra and evaluated for in vitro antibacterial and antifungal activity. Molecular docking studies were performed to calculate docking scores and to propose the binding mode of sulphonyl urea derivatives with E. coli beta-ketoacyl-acp synthase III, a key enzyme that catalyzes the initial step of fatty acid biosynthesis via a type II dissociated fatty acid synthase. The results from this study revealed that the derivatives 7g, vj, 7l and 7o can become possible lead molecules for antimicrobial drug discovery. In vitro antimicrobial studies confirmed that the derivatives 7g, 7j, 7l and 7o have demonstrated better activity than the others. Keywords: β-ketoacyl-acyl carrier protein synthase III (FabH); sulphonyl urea derivatives characterization; antimicrobial activity; in vitro; in silico. Se sintetizó una serie de 15 derivados de sulfonilurea (7a-7o) que contiene diversos sustituyentes heterocíclicos, caracterizados por análisis elemental, IR, RMN de 1H y de 13C espectros RMN, y se evaluaron in vitro para actividad antibacteriana y antifúngica. Se realizaron estudios de acoplamiento molecular para calcular las puntuaciones de conexión y proponer el modo de unión de derivados de sulfonilurea con E. coli beta-cetoacil-ACP sintasa III, una enzima clave que cataliza la etapa inicial de la biosíntesis de ácidos grasos a través de un tipo II disociado ácido graso sintasa. Los resultados de este estudio revelaron que los derivados de 7 g, vj, 7l y 7o pueden convertirse en posibles moléculas de plomo para el descubrimiento de fármacos antimicrobianos. Los estudios in vitro confirmaron que los derivados de 7g, 7j, 7l y 7o han demostrado una mejor actividad antimicrobiana que los otros. Palabras clave: Sintasa β-cetoacil-ACP III (FabH); caracterización de derivados de sulfonilurea; actividad antimicrobiana; in vitro; in silico. Pyrrolidine and thiophene moieties are key components of heterocycles that exhibit various therapeutic characteristics. Diverse therapeutic applications of compounds containing these moieties are reported in the literature (Alsaid, El-Gazzar & Ghorab, 2013; Bespalove, Sedavkina & Kulikova, 1989; Cheng, Wang, Fang, Tang & Xu, 2008; Dzhuraev, Karimkulov & Makhsulov-Amanov, 1992; Huang et al., 2013; Kumar & Krishnan, 2012; Malmström et al., 2013; Min et al., 2013; Oh et al., 2014; Omaima & Fatma,1992; Yu, Detistov & Orlov, 2008; Zareef, Iqbal & Arfan, 2008). The sulfonamide (SO2-NH-) group (Camargo-Ordonez et al., 2011) also has great importance in medicinal chemistry. Efficient chemical synthetic strategies of biologically active compounds play a crucial role in the advancement of life sciences. Inspired by this widely agreed perspective, the authors have undertaken the simple strategies for the synthesis of novel compounds containing all these pharmacologically active centers. The biosynthesis of fatty acid is an essential process for the survival of the organism (Magnuson, Jackowski, Rock & Cronan, 1993; White, Zheng, Zhang & Rock, 2005). The enzymes involved in the fatty acid biosynthesis pathway provide a set of targets for the discovery of antibiotics. β-ketoacyl-[acyl-carrier-protein] synthase III is an enzyme that participates in fatty acid biosynthesis of bacterial membrane. 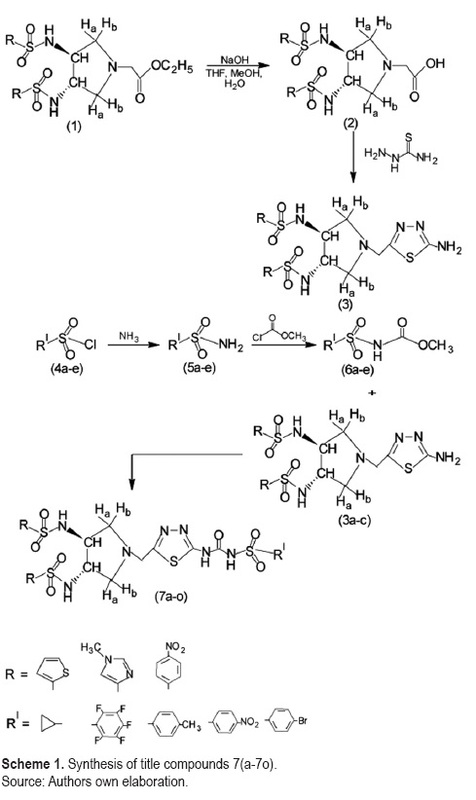 Fatty acid synthesis is initiated by the condensation of acetyl-coenzyme with malonyl-acyl carrier protein by β-ketoacyl-[acyl-carrier-protein] synthase III (Jackowski, Murphy & Cronan, 1989; Jackowski & Rock, 1987). The crucial role of this enzyme, its unique structural features combined with its ubiquitous occurrence in bacteria, has made it novel and attractive target for the development of antibacterial drugs. Crystal structures of FabH have been reported from Mycobacterium tuberculosis (Davies, Heath, White & Rock, 2000; Qiu et al., 2001; Scarsdale, Kazanina, He, Reynolds & Wright, 2001), Staphylococcus aureus (Qiu et al., 2005) and Escherichia coli (Qiu et al., 1999). It was reported that FabH is critical in the initiation of Type II fatty acid biosynthesis (consists of series of discrete proteins that catalyze various reactions in fatty acid biosynthetic pathway) in both Gram positive and Gram negative bacteria (Lai & Cronan, 2003). The present study is aimed to synthesize and characterize novel sulphonyl urea derivatives and evaluate for their antimicrobial activity. 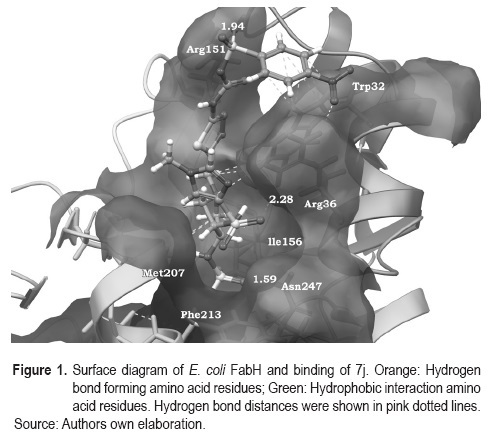 It is in silico demonstrated that the inhibition of FabH enzymes is responsible for the antimicrobial activity of compounds under study. All chemicals and reagents were procured from Merck India limited. The standard bacterial and fungal stains were procured from National Centre for Cell Science, Pune, India. Melting points were determined using X-6 digital display binocular microscope. Infrared spectra were taken on a nicolet nexus 470 FT-IR spectrometer using smear KBr crystals. NMR spectra were recorded on a Bruker Avance (300 MHz) spectrometer. All molecules were docked into binding pocket by using Grid-based Ligand Docking with Energetics (GLIDE) module of Schrodinger. A total of 10 ligand conformations were allowed and finally top score conformation was selected as active conformation. Molecules were analyzed based on docking score, interacting amino acids and hydrogen bonds. The synthesized ligands were sketched and geometry was optimized using Maestro workspace of Schrodinger Suite 2012. Ligands for docking were prepared by using Ligprep, a versatile program to generate three dimensional module of Schrodinger and minimized using OPLS-2005 force field. Crystal coordinates of E. coli beta-ketoacyl-acp synthase III (FabH) were taken from PDB ID 1HNJ. Protein for docking studies was prepared using protein preparation wizard of Schrodinger (Maestro, v9.3 Schrodinger, LLC, New York, NY). Bond orders and formal charges were added for hetero groups and hydrogens were added to all atoms in the system. Water molecules with in 5A0 distance were removed. Glide energy grid with coordinates of X: 28.56; Y: 8.86; Z: 33.83 around malonyl-coA binding site were generated for the prepared protein. Ethyl 2-((3S, 4S)-3, 4-disubstituted-sulfonamido)pyrrolidinyl-N-acetate derivatives (1a-1c) were synthesized by the procedure reported in the literature (Santosh, Raveendra, Madhu & Ravindranath, 2012). An arqueous solution of NaOH (2N, 30 mL) was added to the solution of ester 1a (5 mmol, 2.398 g) in tetrahydrofuran / MeOH / H20 (1:1:1) and stirred at room temp. The excess of solvent was evaporated under vacuum to give crude residue. The residue was washed with EtOAc, acidified with 1N HCl to a pH 2 and was filtered under vacuum to get fine solid. In case a solid is not obtained, the solution was extracted with two 100 mL portions of EtOAc. The organic layer was collected, washed with water, brine, dried over anhydrous Na2SO4, filtered and evaporated under vacuum to give crude acid product. The crude product was purified by column chromatography (60 mesh-silica gel -120 mesh-silica gel, Eluent: 70% EtOAc-30% petroleum ether). Similar procedure was followed for the synthesis of other compounds of the series. Concentrated H2SO4 (12 mL) was added slowly to a mixture of carboxylic acid 2a (10 mmol, 4.515 g) and thiosemicarbazide (12 mmol, 1.093 g) in a three necked round bottom flask fitted with a reflux condenser. The reaction mixture was refluxed on a water bath for 3 h, poured into crushed ice and neutralized with ammonia solution. The yellow colored solid separated was filtered, washed with saturated sodium bicarbonate solution and water, dried and recrystallized from ethanol. Similar procedure was adopted for the synthesis of other compounds (3b & 3c) of the series. A mixture of cyclopropanesulfonylchloride (10 mmol, 1.906 g) and 20% aqueous ammonia solution was taken in a four necked round bottom flask fitted with a reflux condenser. The reaction mixture was heated at 75 ºC - 80 ºC for 3 h. The reaction mixture was allowed to stand for 1 h at 15 ºC, the solid that separated was filtered, washed with large quantity of water and dried to get 4-methyl benzenesulfonamide. Similar procedure was adopted for the synthesis of other compounds (5a-5e) of the series. A mixture of cyclopropanesulfonylchloride (10 mmol, 1.21 g), ethyl methyl ketone (8 mL) and potassium carbonate was taken in a four necked round bottom flask and heated to 80 ºC for 30 min. Methyl chloroformate (10 mL) was added drop wise at 45 ºC. The mixture was heated for 8 h at 50 ºC. After the completion of reaction (monitored by TLC), the reaction mixture was poured into ice cold water and extracted with ethyl acetate. The pH of the aqueous layer was adjusted to a 2.5 by the addition of hydrochloric acid and extracted with ethyl acetate. The organic layer was dried over anhydrous sodium sulfate and the solution was concentrated to dryness. The solid thus obtained was recrystallized from ethanol. Similar procedure was adopted for the synthesis of other compounds (6b-6e) of the series. A mixture of 6a (10 mmol, 1.409 g) and amine 3a (10 mmol, 1.79 g) in toluene (50 mL) was taken in a three necked round bottom flask fitted with a reflux condenser and a mechanical stirrer. The reaction mixture was refluxed for 4 h, cooled to room temperature, resulting solid was filtered, dried and recrystallized from methanol to obtain 7a. Similar procedure was adopted for the synthesis of other compounds (7b-7o) of the series. The sequence of reactions is given in the scheme 1. Compound; R; Molecular formula; Yield (%); m.p. (ºC); Element Found% (calculated%); IR (Group)νmax in cm1; 1H NMR (300MHz, DMSO-D6) δ ppm. 2a: Thiophene; C14H17N3O6S4;76;191-3; C 37.21 (37.24), H 3.77 (3.79), N 9.33 (9.31); (C-N Cyclic)1100, (C-N exo)1117, (O = S = O)1320 and 1185, (C-N imidazole)1550, (C = N)1615, (C = O Acid)1755, (N-H) 3210; 7.65-7.22 (m, 6H, of thiophene), 7.47 (s, 2H, SO2-NH-), 4.22(s,1H, -COOH), 3.50 (m, 2H, -SO2-N-CH-), 3.25 (s, 2H, -N-CH2-CO), 2.88(m, 2H, -CHa- protons of pyrrolidine), 2.29 (m, 2H, -CHb- protons of pyrrolidine). 2b: 1-Methyl-1H-imidazole; C14H21N7O6S2;71;197-9; C 37.55 (37.58), 4.69 (4.73), N 21.89 (21.91); (C-N Cyclic)1116, (C-N exo)1120, (O = S = O)1326 and 1186, (C-N imidazole)1559, (C = N)1617, (C = O Acid)1757, (N-H) 3215; 7.90 (2H, -N-CH-N- of imidazole), 7.47 (s, 2H, SO2-NH-), 6.93 (s, 2H, N-CH- of two imidazole), 4.22 (s, 1H, -COOH), 3.65 (s, 6H, N- CH3 of imidazole), 3.50 (m, 2H, -SO2-N-CH-), 3.25 (s, 2H, -N-CH2-CO-), 2.88(m, 2H, -CHa- protons of pyrrolidine), 2.29 (m, 2H, -CHb- protons of pyrrolidine). 2c: p-Nitro phenyl; C18H19N5O10S2;82;182-4; C 40.81 (40.83), H 3.63 (3.62), N 13.28 (13.23); (C-N Cyclic)1122, (C-N exo)1125, (O = S = O)1323 and 1189, (C-N imidazole)1557, (C = N)1619, (C = O Acid)1762, (N-H) 3217; 8.12-8.39 (m, 8H, aromatic protons), 7.47 (s, 2H, SO2-NH-), 4.22 (s, 1H, -COOH), 3.50 (m, 2H, -SO2-N-CH-), 3.25 (s, 2H, -N-CH2-CO-), 2.88(m, 2H, -CHa- protons of pyrrolidine), 2.29 (m, 2H, -CHb- protons of pyrrolidine). 3a: Thiophene; C15H18N6O4S5;79;197-9; C 35.55 (35.56), H 3.52 (3.58), N 16.53 (16.59); (C-S-C thiadiazole) 695, (O = S = O)1323 and 1185, (C = N thiadiazole)1670, (-NH2)3356 and 3263, (NH sulphonamide)3421; 7.65-7.22 (m, 6H, of thiophene), 7.47 (s, 2H, SO2-NH-), 3.62 (s, 2H, -N-CH2-), 3.33 (s, 2H, -NH2), 3.11 (m, 2H, -SO2-N-CH-), 2.61(m, 2H, -CHa- protons of pyrrolidine), 2.55 (m, 2H, -CHb- protons of pyrrolidine). 3b: 1-Methyl-1H-imidazole; C15H22N10O4S3;68;202-4; C 35.81 (35.85), H 4.44 (4.41), N 27.82 (27.87); (C-S-C thiadiazole)705, (O = S = O)1326 and 1187, (C = N thiadiazole)1673, (-NH2)3359 and 3268, (NH sulphonamide)3420; 7.90(2H, -N-CH-N- of imidazole), 7.47 (s, 2H, SO2-NH-), 6.93 (s, 2H, N-CH- of two imidazole), 3.65 (s, 6H, N- CH3 of imidazole), 3.59 (s, 2H, -N-CH2-), 3.35 (s, 2H, -NH2), 3.17 (m, 2H, -SO2-N-CH-), 2.88(m, 2H, -CHa- protons of pyrrolidine), 2.52 (m, 2H, -CHb- protons of pyrrolidine). 3c: p-Nitro phenyl; C19H20N8O8S3;73;192-4; C 39.09 (39.04), H 3.42 (3.45), N 19.15 (19.17); (C-S-C thiadiazole)728, (O = S = O)1337 and 1199, (-NH2)3367 and 3279, (C = N thiadiazole)1680, (NH sulphonamide)3422; 8.12-8.39 (m, 8H, aromatic protons), 7.47 (s, 2H, SO2-NH-), 3.69 (s, 2H, -N-CH2-), 3.50 (m, 2H, -SO2-N-CH-), 3.39 (s, 2H, -NH2), 2.97(m, 2H, -CHa- protons of pyrrolidine), 2.33 (m, 2H, -CHb- protons of pyrrolidine). 6a: Cyclopropyl; C5H9NO4S;61;205-7; C 33.53 (33.51), H 5.09 (5.06), N 7.81 (7.82); (C-O)1254, (-CH3)1342 and 1265, (C = O)1640, (-CH3)2915 and 2875, (N-H)3212; 9.22 (s, 1H, SO2-NH-), 3.67 (s, 3H, -OCOCH3), 1.75(m, 1H, -SO2-CH), 0.79(m, 4H, cyclopropyl -CH2-). 6b: Pentafluorophenyl; C8H4F5NO4S; 59; 186-8; C 31.45(31.48), H 1.35 (1.32), N 4.52 (4.59); (C-O)1269, (-CH3)1358 and 1279, (C = O)1648, (-CH3)2915 and 2875, (N-H)3215; 9.22 (s, 1H, SO2-NH-), 3.69 (s, 3H, -OCOCH3). 6c: p-Tolyl; C9H11NO4S;69;192-4; C 47.19 (47.15), H 4.83 (4.84), N 6.15 (6.11); (C-O)1257, (-CH3)1347 and 1264, (C = O)1650, (-CH3)2915 and 2875, (N-H)3214; 8.86 (s, 1H, SO2-NH-), 7.83 (d, 2H, Ar-H meta to methyl), 7.34 (d, 2H, Ar-H ortho to methyl), 3.57 (s, 3H, -OCOCH3). 6d: p-Bromo phenyl; C8H8BrNO4S;62;180-2; C 32.67 (32.67), H 2.77 (2.74), N 4.73 (4.76); (C-O)1259, (-CH3)1349 and 1268, (C = O)1654, (-CH3)2915 and 2875, (N-H)3203; 8.89 (s, 1H, SO2-NH-), 7.87 (d, 2H, Ar-H meta to bromo), 7.77 (d, 2H, Ar-H ortho to bromo), 3.59(s, 3H, -OCOCH3). 6e: p-Nitro phenyl; C8H8N2O6S;67;196-8; C 36.89 (36.92), H 3.12 (3.10), N 10.73 (10.77); (C-O)1263, (-CH3)1352 and 1273, (C = O)1666, (-CH3)2915 and 2875, (N-H)3217; 8.97(s, 1H, SO2-NH-), 8.49 (d, 2H, Ar-H ortho to nitro), 8.21 (d, 2H, Ar-H meta to nitro), 3.65(s, 3H, -OCOCH3). Compound; R; R1; Molecular formula; Yield (%); m.p. (ºC); Element Found% (calculated%); IR Groupνmax in cm1; 1H NMR (300MHz, DMSO-D6) δ ppm; 13C-NMR (300MHz, DMSO-D6) (δ ppm). 7a: Thiophene; Cyclopropyl; C19H23N7O8S6;61;212-4; C 34.09 (34.07), H 3.43 (3.46), N 14.61 (14.64); (N-N)1052, (O = S = O)1362 and 1183, (C-N urea)1310, (C = O urea)1640, (NH sulphonamide)3319; 9.01 (s, 1H, SO2-NH-), 7.45-7.01 (m, 6H, of thiophene), 7.37 (s, 2H, SO2-NH-), 5.94 (s, 1H, NH, D2O-exchange, disappear), 3.45 (s, 2H, -N-CH2-), 3.01 (m, 2H, -SO2-N-CH-), 2.54(m, 2H, -CHa- protons of pyrrolidine), 2.35 (m, 2H, -CHb- protons of pyrrolidine), 1.54 (m, 1H, -SO2-CH), 0.67(m, 4H, cyclopropyl -CH2-); 62.3, 64.1, 137.2, 128.7, 132.6, 135.9,57.8, 64.1, 66.1, 157.5, 48.9, 12.5, corresponding to C2 and C2, C3 and C3,, C4 and C4,, C5 and C5,, C6 and C6,, C7 and C7,, C8, C9, C10, C11, C12, C13 and C13, respectively. 7b: Thiophene; Pentafluorophenyl; C22H18F5N7O8S6; 59;192-4; C 33.22 (33.20), H 2.25 (2.28), N 12.29 (12.32); (N-N) 1033, (O = S = O)1352 and 1165, (C-N urea)1301, (C = O urea)1631, (NH sulphonamide)3311; 9.14 (s, 1H, SO2-NH-), 7.71-7.12 (m, 6H, of thiophene), 7.45 (s, 2H, SO2-NH-), 5.97 (s, 1H, NH, D2O-exchange, disappear), 3.65 (s, 2H, -N-CH2-), 3.03 (m, 2H, -SO2-N-CH-), 2.60 (m, 2H, -CHa- protons of pyrrolidine), 2.59 (m, 2H, -CHb- protons of pyrrolidine). 7c: Thiophene; p-Tolyl; C23H25N7O7S6;69;209-11; C 39.21 (39.25), H 3.56 (3.58), N 13.90 (13.93); (N-N) 1049, (O = S = O)1359 and 1179, (C-N urea)1308, (C = O urea)1641, (NH sulphonamide)3318; 8.86 (s, 1H, SO2-NH-), 7.83 (d, 2H, Ar-H meta to methyl), 7.62-7.24 (m, 6H, of thiophene), 7.32 (s, 2H, SO2-NH-), 7.34 (d, 2H, Ar-H ortho to methyl), 6.11 (s, 2H, NH, D2O-exchange, disappear), 3.45 (s, 2H, -N-CH2-), 3.08 (m, 2H, -SO2-N-CH-), 2.67(m, 2H, -CHa- protons of pyrrolidine), 2.51 (m, 2H, -CHb- protons of pyrrolidine), 1.90(s, 3H, -CH3, ArCH3). 7d: Thiophene; p-Bromo phenyl; C22H22BrN7O7S6; 68;201-3; C 34.33 (34.37), H 2.90 (2.88), N 12.74 (12.75); (N-N) 1045, (O = S = O)1357 and 1174, (C-N urea)1306, (C = O urea)1639, (NH sulphonamide)3316; 8.91 (s, 1H, SO2-NH-), 7.85 (d, 2H, Ar-H meta to bromo), 7.78 (d, 2H, Ar-H ortho to bromo), 7.41-7.16 (m, 6H, of thiophene), 7.44 (s, 2H, SO2-NH-), 5.71 (s, 2H, NH, D2O-exchange, disappear), 3.67 (s, 2H, -N-CH2-), 3.15 (m, 2H, -SO2-N-CH-), 2.66 (m, 2H, -CHa- protons of pyrrolidine), 2.71 (m, 2H, -CHb- protons of pyrrolidine). 7e: Thiophene; p-Nitro phenyl; C22H22N8O9S6;71; 189-91; C 35.16 (35.19), H 2.91 (2.95), N 14.89 (14.92); (N-N) 1040, (O = S = O)1354 and 1169, (C-N urea)1303, (C = O urea)1636, (NH sulphonamide)3313; 9.12 (s, 1H, SO2-NH-), 8.58 (d, 2H, Ar-H ortho to nitro), 8.28 (d, 2H, ArH meta to nitro), 7.50-7.01 (m, 6H, of thiophene), 7.52 (s, 2H, SO2-NH-), 6.27 (s, 2H, NH, D2O-exchange, disappear), 3.69 (s, 2H, -N-CH2-), 3.18 (m, 2H, -SO2-N-CH-), 2.71(m, 2H, -CHa- protons of pyrrolidine), 2.67 (m, 2H, -CHb- protons of pyrrolidine). 7f: 1-Methyl-1H-imidazole; Cyclopropyl; C19H27N11 O7S4; 67;209-11; C 35.11 (35.12), H 4.15 (4.19), N 23.69 (23.71); (N-N)1058, (O = S = O)1379 and 1189, (C-N urea)1316, (C = O urea)1642, (NH sulphonamide)3325; 9.25 (s, 1H, SO2-NH-), 7.91 (2H, -N-CH-N- of imidazole), 7.48 (s, 2H, SO2-NH-), 6.87 (s, 2H, N-CH- of two imidazole), 5.98 (s, 2H, NH, D2O-exchange, disappear), 3.62 (s, 6H, N-CH3 of imidazole), 3.51 (s, 2H, -N-CH2-), 3.23 (m, 2H, -SO2-N-CH-), 2.76 (m, 2H, -CHa- protons of pyrrolidine), 2.39 (m, 2H, -CHb- protons of pyrrolidine), 1.68(m, 1H, -SO2-CH), 0.65 (m, 4H, cyclopropyl -CH2-). 7g: 1-Methyl-1H-imidazole; Pentafluorophenyl; C22H38F5N11O7S4;58;198-200; C 37.15 (37.18), H 4.55 (4.56), N 18.31 (18.34); (N-N) 1035, (O = S = O)1359 and 1171, (C-N urea)1306, (C = O urea)1633, (NH sulphonamide)3316; 9.27 (s, 1H, SO2-NH-), 7.83 (2H, -N-CH-N- of imidazole), 7.41 (s, 2H, SO2-NH-), 6.81 (s, 2H, N-CH- of two imidazole), 6.10 (s, 2H, NH, D2O-exchange, disappear), 3.65 (s, 6H, N-CH3 of imidazole), 3.53 (s, 2H, -N-CH2-), 3.15 (m, 2H, -SO2-N-CH-), 2.83 (m, 2H, -CHa- protons of pyrrolidine), 2.47 (m, 2H, -CHb- protons of pyrrolidine); 62.7, 64.6, 143.2, 127.2, 122.8, 35.5, 58.8, 65.1, 66.9, 156.8, 125.1, 151.9, 139.1, 148.7 corresponding to C2 and C2, C3 and C3', C4 and C4', C5 and C5', C6 and C6', C7 and C7', C8, C9, C10, C11, C12, C13 and C13', C14 and C14', C15 respectively. 7h: 1-Methyl-1H-imidazole; p-Tolyl; C23H29N11O7 S4;59;201-3; C 39.45 (39.47), H 4.16 (4.18), N 22.00 (22.02); (N-N) 1055, (O = S = O)1376 and 1186, (C-N urea)1314, (C = O urea)1640, (NH sulphonamide)3323; 8.89 (s, 1H, SO2-NH-), 7.97 (2H, -N-CH-N- of imidazole), 7.84 (d, 2H, ArH meta to methyl), 7.58 (s, 2H, SO2-NH-), 7.39 (d, 2H, Ar-H ortho to methyl), 6.97 (s, 2H, N-CH- of two imidazole), 6.17 (s, 2H, NH, D2O-exchange, disappear), 3.65 (s, 6H, N-CH3 of imidazole), 3.69 (s, 2H, -N-CH2-), 3.25 (m, 2H, -SO2-N-CH-), 2.78(m, 2H, -CHa- protons of pyrrolidine), 2.45 (m, 2H, -CHb-protons of pyrrolidine). 7i: 1-Methyl-1H-imidazole; p-Bromo phenyl; C22H26 BrN11O7S4; 71; 199-201; C 34.51 (34.56), H 3.39 (3.43), N 21.11 (20.15); (N-N)1050, (O = S = O)1372 and 1183, (C-N urea)1313, (C = O urea)1638, (NH sulphonamide)3322; 8.97 (s, 1H, SO2-NH-), 7.89 (2H, -N-CH-N- of imidazole), 7.89 (d, 2H, Ar-H meta to bromo), 7.67 (d, 2H, Ar-H otho to bromo), 7.47 (s, 2H, SO2-NH-), 6.93 (s, 2H, N-CH- of two imidazole), 6.12 (s, 2H, NH, D2O-exchange, disappear), 3.65 (s, 6H, N-CH3 of imidazole), 3.64 (s, 2H, -N-CH2-), 3.28 (m, 2H, -SO2-N-CH-), 2.67(m, 2H, -CHa- protons of pyrrolidine), 2.54 (m,2H, -CHb- protons of pyrrolidine). 7j: 1-Methyl-1H-imidazole; p-Nitro phenyl; C22H26 N12O9S4;70;207-9; 36.15 (36.16), H 3.55 (3.59), N 23.05 (23.00); (N-N)1046, (O = S = O)1365 and 1175, (C-N urea)1310, (C = O urea)1635, (NH sulphonamide)3319; 8.76 (s, 1H, SO2-NH-), 8.35 (d, 2H, Ar-H ortho to nitro), 8.02 (d, 2H, Ar-H meta to nitro), 7.91 (2H, -N-CH-N- of imidazole), 7.37 (s, 2H, SO2-NH-), 6.93 (s, 2H, N-CH- of two imidazole), 6.16 (s, 2H, NH, D2O-exchange, disappear), 3.65 (s, 6H, N-CH3 of imidazole), 3.44 (s, 2H, -N-CH2-), 3.17 (m, 2H, -SO2-N-CH-), 2.71 (m, 2H, -CHa- protons of pyrrolidine), 2.44 (m, 2H, -CHb- protons of pyrrolidine). 7k: p-Nitro phenyl; Cyclopropyl; C23H25N9O11S4; 69;202-4; C 37.71 (37.75), H 3.40 (3.44), N 15.19 (17.23); (N-N)1039, (O = S = O)1356 and 1165, (C-N urea)1321, (C = O urea)1645, (NH sulphonamide)3316; 9.21 (s, 1H, SO2-NH-), 8.14-8.38 (m, 8H, aromatic protons), 7.41 (s, 2H, SO2-NH-), 6.13 (s, 2H, NH, D2O-exchange, disappear), 3.65 (s, 2H, -N-CH2-), 3.54 (m, 2H, -SO2-N-CH-), 2.87(m, 2H, -CHa- protons of pyrrolidine), 2.37 (m, 2H, -CHb- protons of pyrrolidine), 1.71 (m, 1H, -SO2-CH), 0.74 (m, 4H, cyclopropyl -CH2-). 7l: p-Nitro phenyl; Pentafluorophenyl; C26H20F5N9 O11S4;61;204-6; C 36.38 (36.41), H 2.31 (2.35), N 14.68 (14.70); (N-N) 1025, (O = S = O)1339 and 1152, (C-N urea)1311, (C = O urea)1631, (NH sulphonamide)3309; 9.16 (s, 1H, SO2-NH-), 8.22-8.32 (m, 8H, aromatic protons), 7.48 (s, 2H, SO2-NH-), 6.13 (s, 2H, NH, D2O-exchange, disappear), 3.70 (s, 2H, -N-CH2-), 3.51 (m, 2H, -SO2-N-CH-), 2.87(m, 2H, -CHa-protons of pyrrolidine), 2.43 (m, 2H, -CHb- protons of pyrrolidine). 7m: p-Nitro phenyl; p-Tolyl; C27H27N9O11S4;62;212-4; C 41.46 (41.48), H 3.47 (3.48), N 16.09 (16.12); (N-N) 1035, (O = S = O)1353 and 1161, (C-N urea)1319, (C = O urea)1641, (NH sulphonamide) 3315; 8.94 (s, 1H, SO2-NH-), 8.19-8.32 (m, 8H, aromatic protons), 7.88 (d, 2H, Ar-H meta to methyl ), 7.43 (s, 2H, SO2-NH-), 7.34 (d, 2H, Ar-H ortho to methyl ), 6.16 (s, 2H, NH, D2O-exchange, disappear), 3.67 (s, 2H, -N-CH2-), 3.63 (m, 2H, -SO2-N-CH-), 2.96 (m, 2H, -CHa- protons of pyrrolidine), 2.45 (m, 2H, -CHb- protons of pyrrolidine), 2.06(s, 3H, -CH3, ArCH3). 7n: p-Nitro phenyl; p-Bromo phenyl; C26H24BrN9O11 S4;69;219-21; C 36.85 (36.88), H 2.83 (2.86), N 14.81 (14.89); (N-N) 1032, (O = S = O)1350 and 1158, (C-N urea)1317, (C = O urea)1638 (NH sulphonamide)3313; 8.92 (s, 1H, SO2-NH-), 8.12-8.39 (m, 8H, aromatic protons), 7.79 (d, 2H, Ar-H meta to bromo), 7.63 (d, 2H, Ar-H ortho to bromo), 7.45 (s, 2H, SO2-NH-), 6.16 (s, 2H, NH, D2O-exchange, disappear), 3.75 (s, 2H, -N-CH2-), 3.50 (m, 2H, -SO2-N-CH-), 3.01 (m, 2H, -CHa- protons of pyrrolidine), 2.36 (m, 2H, -CHb- protons of pyrrolidine). 7o: p-Nitro phenyl; p-Nitro phenyl; C26H24N10O13S4; 76; 206-8; C 38.41 (38.42), H 2.95 (2.98), N 17.19 (17.23); (N-N) 1028, (O = S = O)1344 and 1155, (C-N urea)1314, (C = O urea)1634, (NH sulphonamide)3311; 8.97(s, 1H, SO2-NH-), 8.51 (d, 2H, Ar-H ortho to nitro), 8.17-8.35 (m, 10H, aromatic protons), 7.47 (s, 2H, SO2-NH-), 6.02 (s, 2H, NH, D2O-exchange, disappear), 3.55 (s, 2H, -N-CH2-), 3.52 (m, 2H, -SO2-N-CH-), 2.92 (m, 2H, -CHa- protons of pyrrolidine), 2.29 (m, 2H, -CHb- protons of pyrrolidine); 62.4, 63.5, 146.2, 128.5, 124.1, 151.3, 65.0, 157.4, 59.1, 65.8, 65.1, 155.5, 147.8, 139.6, 136.5, 159.6 corresponding to C2 and C2, C3 and C3', C4 and C4', C5 and C5', C6 and C6', C7 and C7', C8, C9, C10, C11, C12, C13, C14, C15 and C15', C16 and C16', C17 respectively. The title compounds (7a-7o) were synthesized and characterized by elemental, IR and NMR spectral analysis. The compounds were screened for antibacterial and antifungal activity. The bacteria screened were Staphylococus aureus NCCS 2079, Bacillus cereus NCCS 2106, Escherichia coli NCCS 2065 and fungi screened were Aspergillus niger NCCS 1196 and Candida albicans NCCS 2106. β-Ketoacyl acyl carrier protein synthase III initiates fatty acid synthesis in bacteria and is a key target enzyme to assess the antimicrobial activity. 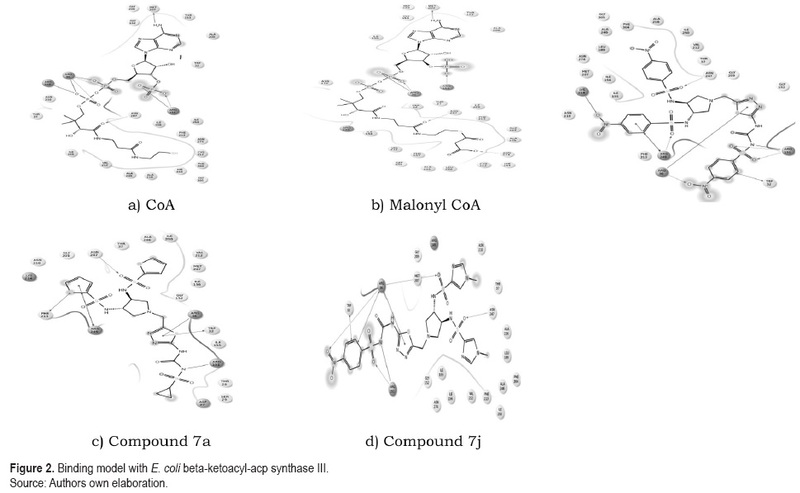 Using the series of sulfonamides under study, we conducted biological assays as well as docking study to find potent inhibitors of E. coli beta-ketoacyl-acp synthase III with specificities against E. coli. 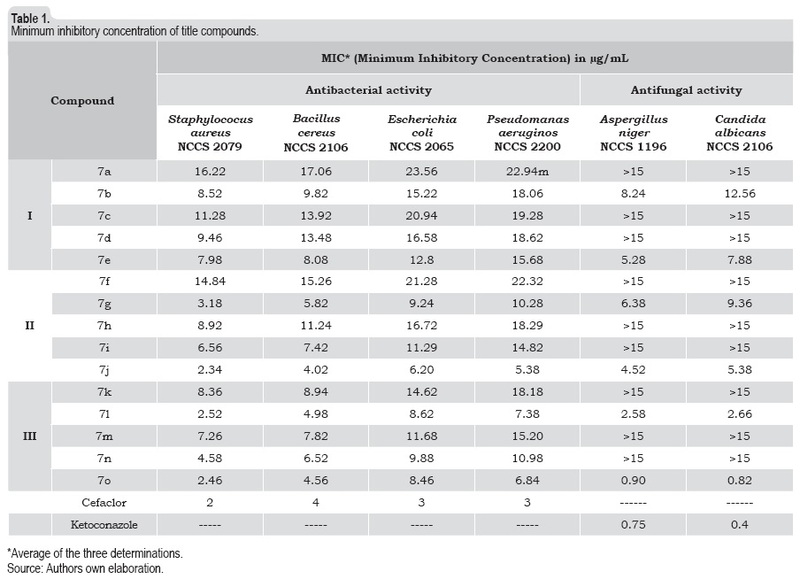 The antimicrobial activity was expressed in terms Minimum Inhibitory Concentration (MIC). MIC was found out by broth dilution method (Wiegand, Hilpert & Hancock, 2008). The activity in each case was compared with that standards. The results are given in the table 1. The compounds were docked with E. coli beta-ketoacyl-acp synthase III using Schrodinger software. The docking score (table 2) and binding site details were analyzed based on interacting amino acids, and hydrogen bonds. Four sulfonamide derivatives (g, j, l, o) showed comparable docking scores as that of malonyl CoA. A comparison of the data obtained from in vitro antimicrobial studies and in silico screening studies indicate that the compound bearing nitro substituent in each series I, II and III namely e, j and o exhibits better antimicrobial activity, while that with cyclopropyl substituent namely a, f and k exhibits least activity than the other compounds of the series. A careful comparison of table 1 and table 2 indicate that the results obtained from both the studies were of the same order of activity i.e. j > o > l > g > n > m > e > k. It can also be inferred from table 1 and table 2 that the compounds j, o, l and g bearing nitro and pentafluorophenyl substituents demonstrated comparable activity to that of standards. Binding site analysis of most active compound 7j showed strong hydrogen bonding interactions. Amino hydrogen of ARG151 forms hydrogen bond with one of the sulfonyl oxygen at a distance of 1.59 Aº. Amino group of ASN 247 forms hydrogen bond with the other sulfonyl oxygen of 7j at a distance of 1.91 Aº. Amino groups of ARG 36 are involved in a hydrogen bonding interaction with nitryl oxygen and pyridyl nitrogen moieties at distances of 2.08 Aº and 2.40 Aº respectively. Nitrophenyl moiety of 7j was involved in π- π stacking with Arg 36 and Trp 32 residues. Thiadiazole ring showed π-cation interaction with Arg 36 residue. We have observed a salt bridge formation between Arg 151 and sulfonamide nitrogen bridging nitrophenyl and thiadiazole ring. Also it is forming strong hydrophobic interactions with Met 207, Phe 213, Trp 32, Ile 156 and Phe 204 residues. Surface diagram of 7j and interacting amino acids with in 5 Aº distance were shown in figure 1. Qiu et al. (2001) reported that E. coli. FabH has disordered residues and were located in four loops, at 84-86, 146-152, 185-217 and 305-307 residues. All the four loops were either involved in ligand binding or in the formation of the active site. Further, except the Cys 146 - Gly 152 loop, the other three loops were known to involve in the formation of FabH dimer interface. The Apo structure of FabH contains Tyr 185-Val 217 loop which includes a large hairpin loop (Leu 189-Met 207) and a portion of the Ca1 helix (Gly 209 - Ala 230). The hairpin loop interacts with CoA using the side-chains of Leu 189 and Met 207. Similar observations were reported in the literature (Huan-Qiu et al., 2009; Yang et al., 2012). Qiu et al. 2001,s had also reported the degradation of malonyl moiety in the active site of CoA and appearance of CoA at binding site of E. coli FabH (Qiu et al., 2001). Hence molecular docking studies for FabH and malonyl-CoA was carried out to identify a plausible malonyl-binding model and shown in the figure 2. The enhanced biological activity of 7j over the other derivatives has been attributed to the hydrophobic interaction with Met 207 and same was not observed in the case of other derivatives. As is evident from the figure 2(b) and as reported in the literature, the interaction of malonyl CoA with Met 207 is important for substrate binding and activity (Qiu et al., 2001). Series of sulphonyl urea derivatives containing heterocyclic moieties namely pyrrolidine, thiophene and imidazole were synthesized and characterized. The compounds were in vitro screened against certain selected bacteria and fungi. 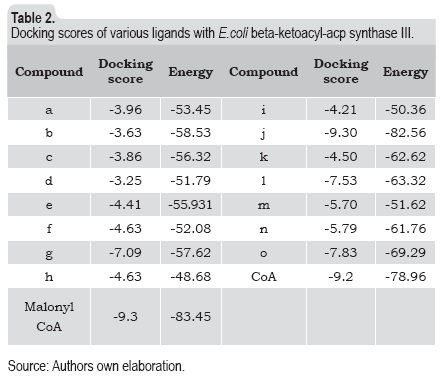 We tried to correlate these results with those obtained in the docking studies of compounds under study with E. coli beta-ketoacyl-acp synthase III. The molecular docking results along with the antimicrobial assays suggested that compounds bearing nitro and pentafluorophenyl groups were potential inhibitors of FabH enzyme than the other members of the series.